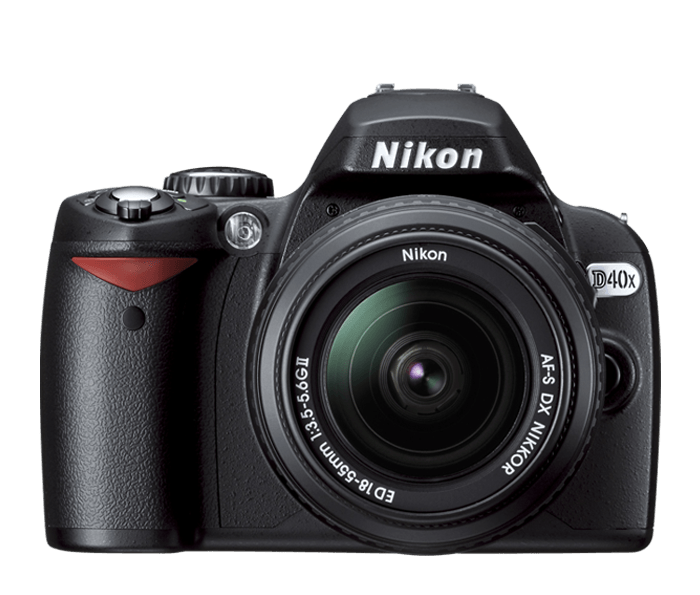 Extraordinary Nikon image quality: The D40X's high-resolution image quality is made possible by Nikon's high-performance, 10.2 effective megapixel, Nikon DX-format CCD imaging sensor and exclusive Nikon image-processing engine. Each assures you’ll get stunning sharpness and colour. Nikon's smallest digital SLR ever: Beautifully styled, the D40X makes high-performance digital SLR photography easier and more convenient than ever. You'll be amazed at the power packed into a camera that weighs just over 16 ounces. High-performance 10.2-megapixel Nikon DX format CCD imaging sensor: Nikon’s DX-format CCD image sensor delivers vivid colour and sharp detail, great for making beautifully detailed enlargements of 24 x 36 inches and beyond. High resolution also provides room for creative cropping. Fast startup with instant shutter response: A fast 0.18 second startup combined with split-second shutter response and rapid-action shooting at up to 3 frames per second makes it easy to freeze special moments instantly. Shoot at up to 3 frames per second: The D40X can fire continuously at a speed of up to 3 frames per second, capturing high-quality action sequences of children in sporting activities such as soccer, baseball and much more. 2.5-inch, 230,000-dot colour LCD monitor with 170-degree wide-angle viewing: Playback images are easy to see and function menus are easier to use with a larger and brighter colour LCD monitor. The large 2.5-inch LCD monitor enables image preview at up to 19 times magnification and has large type fonts with easy-to-view menus. 3 colourful display options: All new display options: classic, graphic and wallpaper. Carefully designed colour schemes help make changing camera settings easier than ever. Built-in Speedlight with i-TTL automatic flash control: Nikon's innovative i-TTL flash control evaluates flash exposure with incredible precision to achieve better automatic flash balance, delivering outstanding results. The built-in flash is always at the ready bringing beautiful exposures to darkened conditions as well as adding a flash to outdoor situations for enhanced twilight shots or an added impact to daylight images. In low-light or back-light situations, added illumination from the built-in Speedlight can make the difference between an average snapshot or a dazzling one. 8 digital vari-program automatic shooting modes: Eight digital vari-program modes include: auto flash-off, portrait, landscape, child, sports, close-up and night portrait, each of which adjusts automatically for optimal results for everyday shooting situations. Each mode considers lighting conditions and possibilities, aperture, shutter speed, white balance, hue, tone, sharpening and more to make creative photography as simple as rotating the mode dial. In-camera image editing: Highly versatile in-camera editing features through the retouch menu include: Nikon D-lighting, red-eye correction, image trimming, image overlay, monochrome black and white, sepia and cyanotype along with skylight, warm tone and custom colour filter effects. This provides greater creative freedom, without the need for a computer, for those who prefer to send pictures directly to a printer. New advanced help menu system with assist images: The D40X's newly introduced assist images help you select the appropriate settings for many camera features by showing an example image typical of that setting, as well as an advanced help menu for the current item selected. The D40x's question mark icon (?) indicates that help is available for the currently selected item; just press the help button beside the LCD monitor to see a context-sensitive help page. Nikon 3D Colour Matrix Metering II: The D40X's 3D Colour Matrix Metering II evaluates each scene for brightness, colour, contrast, size and position of shadows and highlights, selected focus area and camera-to-subject distance, comparing that information against an onboard database of more than 30,000 actual photographic scenes. The result delivers instantly and precisely determined exposures for each scene, even in challenging lighting conditions. Fast, accurate 3-area auto focus: The D40X's advanced 3-area AF system and the refined algorithms inherited from more advanced Nikon digital SLR cameras deliver fast, efficient and precise auto focus. AF refinements deliver greater precision with fast, more consistent subject acquisition and improved focus tracking for consistently sharper pictures. Image optimization options: The D40X's image optimize setting lets photographers adjust colour, contrast and sharpening, as well as other image settings, according to the type of scene or output desired. Settings include: normal, softer, vivid, more vivid, portrait, custom and black and white, each of which are automatically adjusted based on sophisticated Nikon algorithms or user-selected settings for optimum results. Up to 520 images* per battery charge: The supplied EN-EL9 rechargeable battery will allow for shooting up to 520 images per charged based on CIPA battery testing standards. 2, 5, 10, 20 sec. Previously referred to as Digital Vari-Program in the Manual. Previously referred to as Image Optimization in the manual.